Ang mga may ari ng isang kotse kung saan sila nag iwan ng bag na may lamang 40K na cash at tuloy nanakawan ni Spider Kid. Ang "expert" na nagsabing Pinoy daw ang nursery rhyme/song na Tatlong Bibe kagaya ng Bahay Kubo. Alright, the first two items are obvious incidents of sheer idiocy. The third, on the other hand, piqued my interest. Why? Because my Facebook friends are going gaga over “Tatlong Bibe (Three Ducklings)”, and I never really cared about it until my wall got inundated with homemade “Tatlong Bibe” dance videos. Ok, this issue has nothing to do with Philippine Politics, but please indulge me because nangangati ang utak ko. Pagbigyan niyo ako, trip lang. But first, let me give you a bit of context. Tatlong Bibe is of Filipino origin? Online celebrity Dyosa Pockoh featured Tatlong Bibe in as early as 2014. Tatlong bibe entered mainstream pop culture after being featured in the TV show “Be my Lady”. According to “Literary Studies Expert” Miguel Lim Quizon, Tatlong Bibe is a Filipino children’s rhyme passed from older generations. Tatlong Bibe is in the same league as “Bahay Kubo”. Okay, the first two points are hardly debatable because they are fairly recent information and if there’s something wrong about it, somebody would’ve already pointed that out. The third, point, however, is another story. Quizon said Tatlong Bibe is a Filipino children’s rhyme. Because we don’t expect a “Literary Studies Expert” to simply state the obvious and “Bahay Kubo” is a distinctly Filipino children’s rhyme [de Leon 2015], it is fair to conclude that Quizon meant Tatlong Bibe is also distinctly Filipino. Well, ABS-CBN said Quizon is a “Literary Studies Expert”, whatever that means, so we must believe whatever he says, right? No. It’s time for a bit of critical thought. Quizon is a graduate student in Ateneo de Manila’s MA Literary and Cultural Studies [NUS]. He is also an instructor in Don Bosco Technical College-Mandaluyong’s General Education Department. While the source does not say when he will or when he did graduate, a document shows that he presented a research paper on 24 June 2015 as an ADMU graduate student of [NUS]. Assuming that he received an MA degree in November 2015, six months out of graduate school doesn’t make someone an expert, yet. Besides, Tatlong Bibe’s history is such a mundane topic that a grad student is more likely to not take it seriously. So yeah, I take Quizon’s statements with a grain of salt. So what’s the real story behind Tatlong Bibe? Let’s pretend that Tatlong Bibe’s history is one life-changing issue, and I, ThinkingPinoy, will go on a short quest to unravel the mystery. Moreover, scrolling down the article’s comments section, you will see that somebody said Three Ducks was actually a sub-section of the English (UK) children’s rhyme Six Little Ducks. Third, I searched using the keyword phrase “Six Little Ducks song” and I found that it was actually broadcast on 31 July 2015 on the children’s TV show Mother Goose Club. Mother Goose Club is broadcast over the American PBS network [PBS-MGC]. Youtube itself was officially launched on December 2005 [Telegraph], so it’s likely that this may be the earliest Six Little Ducks online video. However, the video description credited a certain artist with the name “Raffi”. Fifth, Six Little Ducks is in Raffi’s 1977 album “More Singable Songs” [RaffiNews]. Raffi (Full name: Raffi Cavoukian) is a well-known Egyptian-Canadian children’s entertainer who was appoint to the Order of British Columbia in 2001 [OBC]. Sixth, The song, regardless of the translation, uses the following melody [Anderson 2013]. Seventh, a 30 May 1976 New York Times review described “Six Little Ducks” as “an old, familiar song” [NYTimes]. Assuming that the youngest NY Times columnist is 25 years old, this implies that “Six Little Ducks” should have already been popular in the United States in the 1950s at the latest. Eighth and googling a little further, ThinkingPinoy discovered that the same melody of the 1944/1945 song “Bell Bottom Trousers” was used for Six Little Ducks [Averill 2014]. Ninth: While Bell Bottom Trousers is the first recording of the said melody, that melody was actually a simplified version of the English (UK) song “Rosemary Lane”[FSU]. The melody sounds different from Tatlong Bibe because the latter is a vastly simplified, easier-to-sing version. Tatlong Bibe: Pinoy or Western? 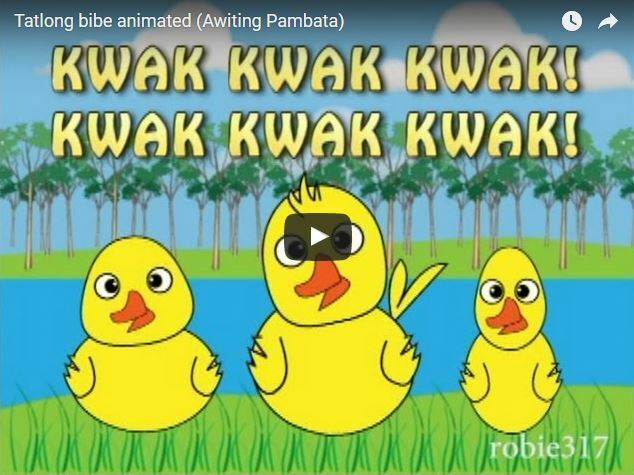 The song “Tatlong Bibe” has an English (US) version entitled Three Ducks. Three Ducks is a part of the longer English (US/UK) song “Six Little Ducks”. 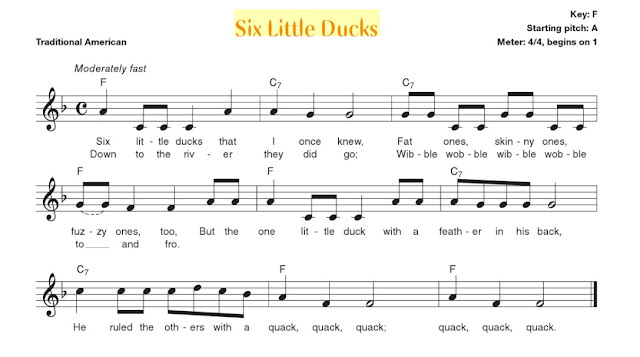 Six Little Ducks borrowed its melody from the 1944 US song “Bell Bottom Trousers”. Bell Bottom Trousers’ melody is a commercially simplified version of the melody for “Rosemary Lane”. Rosemary Lane is a UK folk song that dates as far back as the 1800s. Where did Tatlong Bibe come from? No, it didn’t originate from the Philippines. It’s from the UK. This entire article took me an hour and a half to research, write, and publish. That’s far shorter than interviewing a “Linguistic Studies Expert”. If you feel that I said something inaccurate, check the citations.